Announcement: Explore our Stuart Cary Welch Islamic & South Asian Photograph Collection! 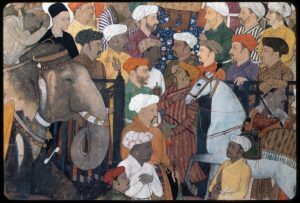 You’re invited to share in a project with us here at the Harvard Fine Arts Library: a digital humanities game using images of Islamic and South Asian art, with the chance to win an art publication of your choice, worth up to $150 USD! For more information about The Stuart Cary Welch Islamic and South Asian Photograph Collection, see the collection page on our website. The collection consists mostly of high-definition photographs of paintings and drawings, both famous and rare, but it also contains images of historical photographs, metalwork, and architecture. At the end of each round, the participants will be entered into a drawing to win an art book of their choice valued up to $150 USD. NOTE: you do need to register for an account and play the game at least once in order to be entered into the prize drawing!! …then access the game HERE! Thanks so much, and we hope you enjoy exploring this exciting collection! If you don’t mind, we’d love your feedback after playing, which you can give via the short form here: https://goo.gl/forms/RLxkvvtmEc0d8A3c2. Have fun! This post is the third in a series about the Stuart Cary Welch Islamic and South Asian Photograph Collection written by the project’s staff and student catalogers in the Digital Images and Slides Collections of the Fine Arts Library. The Stuart Cary Welch South Asian Photograph Collection is a collection of over 60,000 35mm slide images of Islamic and Indian art, which documents artworks from the most prominent civilizations in the Islamicate world spanning the deserts of Uzbekistan all the way through to the Himalayas and onward to the Indian subcontinent. The credit for this collection belongs to its namesake. Stuart Cary Welch made use of his far-flung connections and influence as a renowned curator and art historian to document previously difficult-to-access artworks produced over the course of a millennium. 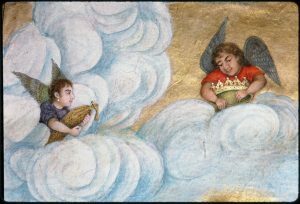 While the Welch collection encompasses artworks of various forms and media in addition to architectural works, painted manuscripts constitute the heart of its contents. 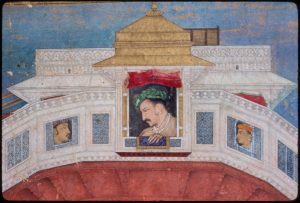 Other images convey not only the trappings of imperial wealth in the Mughal court, but also the social arrangements and hierarchy by which the emperor distinguished himself from the nobles and the nobles from the largely Hindu subjects of the empire. 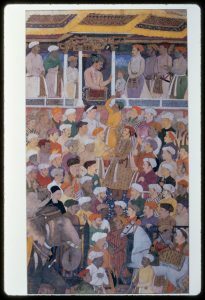 Take the example of this painting at the Museum of Fine Arts Boston, depicting the Emperor Jahangir in the midst of a darbar. 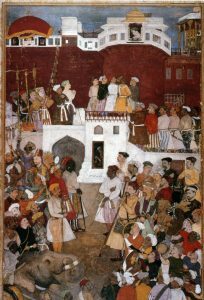 A darbar served an array of purposes including formal discussions of affairs of state and royal ceremonies. 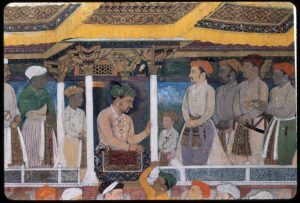 Here, Jahangir is seen in an audience hall surrounded by his son Prince Khurram (Shah Jahan) and grandson Prince Shah Shuja, along with courtiers. The position of the courtiers flanking the emperor denotes their privileged status following the strict protocol governing such ceremonies. Yet another defining feature of Mughal paintings is their striking realism. 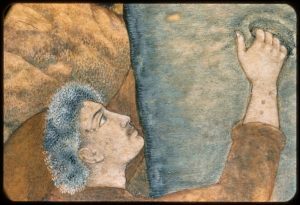 A painting from the Johnson Album housed in the British Library exemplifies the commitment of commissioned artists to extraordinary detail and naturalism. 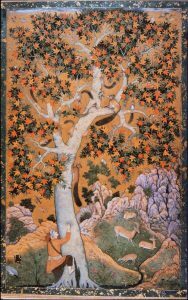 Jahangir championed this particular style, as reflected in this painting that depicts a hunter scaling a tree. 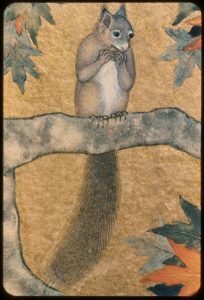 The hunter, whose eyes are set on squirrels high up in the branches, is at the bottom of the tall tree with no shoes. His expression is determined and his right foot is already in climbing action. But, the squirrels above already know that he has no chance. They are going on with their usual business, ignoring the man below. 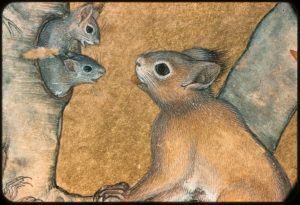 The depictions of squirrels show that the artist spent quite a long time studying them, such that he could accurately capture their busy activities and movements during the autumn season. The aforementioned images provide just a small glimpse of the artwork documented by Stuart Cary Welch during his long, path-breaking career. 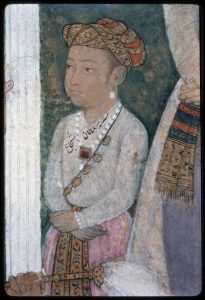 Works from the Mughal Empire have been showcased here, and future blog posts will cover the many other empires and societies in which these artworks were generated. There will be an exhibit of the Welch Collection images at the Fine Arts Library at Littauer Center from January 22, 2018. This post is the second in a series about the Stuart Cary Welch Islamic and South Asian Photograph Collection written by the project’s staff and student catalogers in the Digital Images and Slides Collections of the Fine Arts Library. 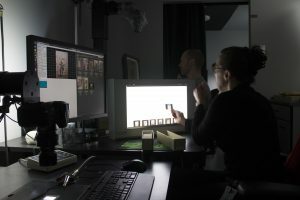 Before the widespread availability of high-quality digital images, patrons at the Fine Arts Library viewed images on 35mm film slides, strips of developed film housed in a lightweight metal, plastic, or paper frame. These could be viewed through a slide projector, or at a light table–the Fine Arts Library still has some of these tables in our Lamont location. The library also has over 607,000 slides left from these days, and most scholars and professionals would have kept their own image collections as well. However, this was not always the case. Stuart Cary Welch, the former curator of Indian and Later Islamic art at Harvard, owned a collection of approximately 65,000 slides, which he left to the Fine Arts Library. 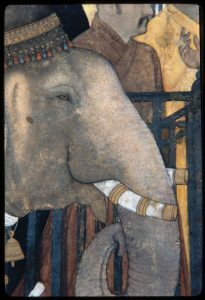 In a memorial essay for Martin Dickson, “Salute to a Coauthor,” Welch later recalled that when he began amassing his slides, a colleague of his “spurned their use as not quite honorable, akin to cheating at cards.” However unorthodox his methods may have been at the time, they were eventually adopted across the field of Islamic and Indian art. 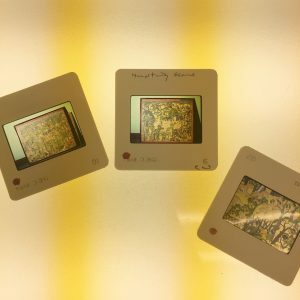 Like any analogue technology, the clarity and resolution of 35mm slides was dependent on the type of film used and the developing technique. Most of the Stuart Cary Welch collection was photographed on Kodachrome, a proprietary film and emulsion technique owned by Kodak and popular throughout the 20th century. Kodachrome was prized for its archival qualities, since the color dye was added to the film surface in layers during the developing process, allowing for greater clarity, nuance, and pigment stability. However, like all archival materials, slide images degrade over time. The Fine Arts Library staff and our team of photographers has been working to preserve these images by re-photographing the physical slide, and then editing this digital image to restore and their original color balance. Slides also fostered a unique collaborative way of working. Welch recalled that Martin Dickson, a professor of Persian Studies at Princeton, “underwent trial by color slide” in 1960 upon first visiting the Welch residence to discuss the project that became The Houghton Shahnama. Veterans of the Fine Arts Library will recall a time when professors prepared for their lectures by sorting slides side by side on a light table and loading them into a carousel. Welch collected images from across America, Europe, the Middle East, and India, and then manually reconstructed manuscripts and artistic communities by grouping dispersed images in the same carousels. As we inventory Welch’s slides, we often come across these carousels, filled with images from his publications and lectures. 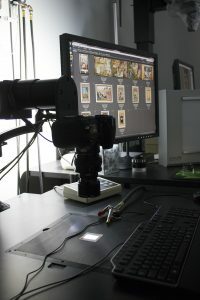 Today, it is so easy to access high-quality digital images that we forget the meticulous processes that earlier scholars went through to assemble their image collections. 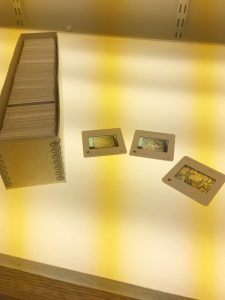 Now that 35mm slide technology is no longer in use, these slides become artifacts of a formative period in the discipline of art history. Our next post will cover some of the treasures of this exciting research collection. Welch, Stuart Cary. “Salute To A Coauthor: Martin Bernard Dickson”. In Intellectual Studies On Islam: Essays Written In Honor Of Martin B. Dickson, 9. Salt Lake City, Utah: University of Utah Press, 1990, 9. This post is the first in a series about the Stuart Cary Welch Islamic and South Asian Photograph Collection written by the project’s staff and student catalogers in the Digital Images and Slides Collections of the Fine Arts Library. In the basement of Lamont Library, a little-known collection is poised to make big contributions to the field of art history. Behind the neatly stacked boxes of microfilm reels and shelves of government documents lining the library’s D-level, a small, tucked-away office provides access to some of the world’s most treasured artworks. Beginning in May of 2017, Lamont’s Room D-10 was transformed to accommodate a collection of over 60,000 35mm slide images of Islamic and Indian art. The collection totals enough to fit 60 small moving boxes and previously belonged to the eminent 20th century scholar Stuart Cary Welch. Cary Welch’s slides were donated to Harvard as part of his estate in 2014, and now a team of students and library staff are working together to unveil this hidden legacy to a larger global audience. This post inaugurates a new blog series written by the Welch project’s staff and student catalogers. 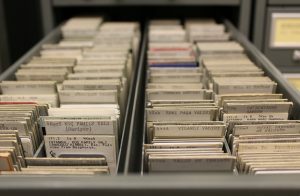 Posts will contextualize how such a unique corpus of images made its way to the Harvard Fine Arts Library and will provide insight into what it’s like to prepare 65,000 slides for a new virtual existence online. To date, upwards of 10,000 Welch slides have already been scanned and published as digital images free to browse and download on Artstor. It may or may not have come as a surprise to Welch, then, that his ‘innovative practice’ would become internationally mainstream over the next few decades. 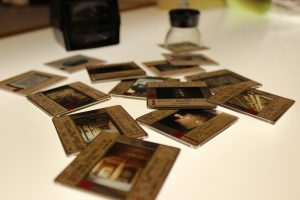 During the second half of the 20th century, university art history departments adopted the use of slides as a pedagogical tool. When digital media replaced analog image technology in the 1990s, these pre-information age collections started to take on new didactic roles beyond the classroom. So what exactly are 35mm slides, how were they used, and why are they important today? Our next post will more closely examine this fascinating film format. Cary Welch, Stuart. 1990. “Salute To A Coauthor: Martin Bernard Dickson”. In Intellectual Studies On Islam: Essays Written In Honor Of Martin B. Dickson, 9. Salt Lake City, Utah: University of Utah Press.